Your Vacation. Their Vacation. Countryside Kennel. It's quality boarding!! 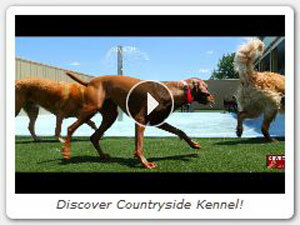 Countryside Kennel, a family owned business located only 5 minutes from London, Ontario, was built in 2007. Our facility is equipped with in-floor heating and air-conditioning to maximize your pet's comfort. Our everyday mission is to provide your pets a safe and entertaining home away from home. The Countryside Kennel staff work diligently to provide all necessities to pets in their care, and strive to make each pet's stay as stress-free and fun as possible. We have boarding packages to fit every dog's need. This includes everything from social group play, individual trail walks to one-on-one play with a staff member. When picking a boarding package, Countryside Kennel places emphasis on age, temperament and size. Check out our latest splash pad option to add more fun during your dog's stay!